Due to popular request, the Spring Fling schedule has been revised, with the Chicago Botanic Garden visit moved from Thursday to Friday so more participants can attend. Please visit the Chicago Spring Fling website to learn more. If you've never been to Chicago Botanic Garden, you won't want to miss it. If you've been before, you can't wait to go back. Thank you Botanic Garden staff, who have been so accommodating and welcoming, and for all you've done on our behalf. We appreciate you. My first perennial garden many years ago was made up entirely of pass-along plants. An elderly neighbor who was also an avid gardener frequently invited me into her garden. We'd walk the paths of lovingly-tended shade borders tucked into corners of her yard, and I'd admire her sunny borders and their succession of blooms. Every time she invited me to visit, spring through fall, she sent me home with divisions and seedlings from her beds. I was a young stay-at-home mom on a tight budget, and thanks to her generosity, before I knew it I had beds full of pink and white phlox and dianthus, yellow marguerite, sundrops, and daylilies, dainty feverfew and Johnny Jump-ups, ferns, hostas, and assorted other pretties. I will always remember how her generosity fed my life-long interest in gardening. Many years and houses later, I still have divisions in my garden from the first hosta she gave me in a place of honor front and center in our garden. She called them August lilies, and I always think of her when they bloom. Lots of things in my life and in the world have changed since then, but the generosity of gardeners sharing plants and information hasn't. This geranium, which stayed green (er. . . red,) all winter, is so pretty with the fresh spring growth contrasting with the older foliage. While most of the other perennials in the garden are just breaking dormancy, this pass-along is the showiest perennial in the garden at the moment, and will continue the show when it blooms in May. A client was enlarging one of her patios in late November last year. The contractors, at her direction, dug out the plants from the border around the patio, piling them up in a corner of the garden with nice, fat, healthy rootballs intact for us to choose whatever we wanted to take home to our own gardens. Although I was sorely tempted by all the beautiful grasses, they wouldn't have been happy in our shady garden. But the epimedium will like it here. Celandine poppy seedlings were the gift of another client last July, and I'm happy to see they survived being transplanted in the dog days of summer. Initially they made their displeasure known, but seem to be settling in well now. I've started a veritable forest of sedums - mostly Autumn Joy, from the garden of another client who suggested we might want to take some pieces home when we cut hers back last fall. I'm not sure how well they'll do here with so little sun, but since they were free, I don't mind experimenting. These cuttings were stuck in the ground in late fall. I didn't expect much rooting that late in the season, but sedum cuttings root so quickly and easily, most of them are back this spring. Tough, drought-tolerant plants, even if they flop or don't bloom in our shady bed, they'll fill in some previously-empty space in the dry shade and tangle of roots under our silver maples. Several stokesias came from the client expanding her patio. I've wanted to experiment with stokesias here. But with so little sun, a limited budget, and so many plants on the list, it would likely have been a long time before I tried them since I think they prefer more sun than our garden provides for optimal blooming. These went into a spot that gets about three hours of morning and afternoon sun. If they don't bloom well here, they can always be passed along to a sunnier garden. Other pass-alongs received late last fall were hurriedly heeled into the veggie garden until I could decide where to put them this spring. I needed to get them out of the veggie garden early since they were in the back of the garden where the trellis needed to go, and I wanted the trellis up before planting the peas. As soon as the sun had thawed the frozen soil, I started moving the plants, some of which were literally piled on top of each other when I hastily heeled them in late last fall. The last of them (or so I thought,) was moved last week, just in time to plant the peas. I had to disturb the already-sprouting-underground-peas in order to get this pass-along out of the veggie garden. It was well worth risking a few peas, which can easily be replanted, in order to rescue this buried treasure. I was pleased to find the substantial root ball still healthy and firm at the bottom of the raised bed, and happy it survived the abuse I heaped upon it when I accidentally piled some other pass-alongs on top of it to wait out the winter in the veggie bed. This one was large enough to be divided into four plants. You can't tell what a substantial plant it really is, since most of it was sprouting underground with several inches to go before reaching the surface. I'm about 99.9% certain its a pulmonaria, though I don't know what cultivar it is. I didn't know what it was when I brought it home, since it had already been cut back for the winter. Sometimes part of the fun of pass-alongs is figuring out what they are! I'm grateful for the generosity of gardening friends and clients who've shared the bounty of their overflowing gardens with me, and enjoy sharing my own seedlings, divisions, and cuttings with them, in the rich tradition of a sweet elderly neighbor, my first gardening friend outside my family. I think of her often when another gardener shares a plant from their garden with me or I share one with them, when a surprise pulmonaria comes up for light and air, or when I can figure out what cultivar an unnamed, treasured pass-along really is. And I always think of her in the waning days of summer when the August lilies bloom. The Obamas will eat the view! Today on the first day of spring, Michelle Obama will be joined by a group of third graders to break ground on a kitchen garden to be grown on the White House lawn. The Washington Post says Today, first lady Michelle Obama will host a groundbreaking for a White House kitchen garden on the South Lawn. She will be joined by students from Bancroft Elementary in Northwest Washington, , whose participation in the project will continue past today, as they help with planting in the coming weeks and harvesting later this year. Although considerably smaller, our new veggie garden is official! This week I planted peas, radishes, and a few of the more cold-tolerant of the gazillions of varieties of lettuce seeds I have. AND the life-changing garlic I planted last fall is sprouting! I can't say for sure which garden I'm more excited about. Obviously I'm very excited about my own little kitchen garden, and I hope it may even inspire neighbors to consider planting their own small plot. Except for the last five years I've always had a veggie garden. Having one here now, however small, is better than Christmas. The White House garden has far more inspiration potential than mine. Growing an organic kitchen garden on the White House lawn could inspire millions in their own backyards, inspire teachers and children to plant gardens in their schoolyards, and further energize the community garden, locavore, organic farming, and environmental movements, as well as helping independent nurseries who still have time to start more veggies, order more seeds, and plan kitchen garden workshops and promotions to energize their businesses during this economic downturn. Thank you, thank you to everyone who signed petitions encouraging the Obamas to Eat the View. Today is a shining example of how we really can make a difference, and I couldn't be more thrilled. This is your host Ralph Edwards speaking, live from Hollywood Theatre. We've had a secret camera standing by, waiting to capture this special occassion. We're here to celebrate one of the greatest moments in the March garden. Your good friend Garden Girl remembers you from way back last April when you first came to live with her, and she conspired with us to make this day possible. In one fateful moment both your lives were changed as she chose you out of all the hellebores in the nursery. She cared for you lovingly as you put down roots in her garden. And now, we have a wonderful surprise. Millions from coast to coast are gathered live with us today. Ms. Hellebore Bloom, THIS is your life! Sunday, March 15th: Bloom Day morning dawned frosty and cold. The world could see you were ready to pop. You knew your time to shine was coming soon. As word went out you were about to bloom, the internets watched in anticipation. They noticed another happy surprise, your sibling, Bud. Come on out Bud, the world is waiting to meet you! Monday, March 16th was a milder day. Just look how far you've come! As you begin to open, anticipation builds. You've already brought so much pleasure. Millions are waiting for your beauty to unfold. Tuesday dawned sunny and mild. Although the Garden Girl was busy with her class, you weren't far away in her thoughts. She knew on such a beautiful day you might decide to bloom. Such a humble thing, you open your petals without fanfare, gazing down with gratitude at the soil that sustains you. Your unassuming beauty is tonic for a troubled world. If you're anything like the blooms that came before you last spring, you'll stick around until fall, making the world a better and more beautiful place. So Ms. Hellebore Bloom, this is your life! Soon other hellebores will join you, but you'll always be the first. May you sprinkle your beautiful offspring throughout the garden to bloom for posterity. May you live long and prosper, bringing beauty and happiness for years to come. As you may recall, on Wednesday I invited readers to enter a drawing for 14 packets of Renee's Garden heirloom Merveille De Quatre Saisons bibb lettuce by leaving a comment saying what vegetables you're planning to grow this gardening season. It's exciting seeing so many people planning vegetable gardens and including veggies in their ornamental gardens, some for the first time this year. It's been fun reading all your comments and getting a sneak peak at what will be growing in your gardens this spring and summer. As promised, names were drawn from a hat. . . the Lawn Man's hat to be precise. . . one of many in his vast collection of baseball hats. To make sure the drawing was completely unbiased, I asked him to draw the names. He was happy to join in the fun. Although I wish I had a packet of seeds to give to everyone who stopped by to comment and enter the giveaway, it IS awfully nice to have fourteen prizes to give away. Congratulations! Winners, please send me an email to lintys2057@gmail.com, and include your full name and mailing address. I'll get the seeds out right away so you'll have them in time to take advantage of the cooler weather lettuce prefers. Thanks to everyone for playing, and thank you Renee for providing the seeds. I'll look forward to hearing from the fourteen winners and getting seeds out to you as soon as possible. Happy gardening, and happy eating! There's not much blooming around here this bloom day. Even the plants overwintering indoors are sulking and tired of winter. Jasminum sambac 'Maid of Orleans' has been either in bud or bloom in the basement all winter - this bloom day, just buds. The first two years I had this plant it stayed very compact. Over the winter it's gone nuts, sprawling all over everything. A bamboo tee pee solved the problem. for now anyway. I still might try some cuttings from this dragonwing (or do you call them angelwing) begonia. Two of these bloomed all winter in the living room. The pelargoniums have been blooming all winter in the basement. They're messy, so I keep removing the budding stems. They respond by sending out more buds. I took some cuttings from them over the winter. These blooms are from a cutting. There's lots of new growth in the garden. Since I never seem to get around to planting early-blooming bulbs in the fall, there are no blooms yet. There is a hellebore budding on this frosty March morning. There are signs of life all over the garden. It won't be long now! Spring is almost here! I'd planned to go back to the garden show Wednesday, but the Lawn Man was sick and we ended up at d0c-in-the-box instead - good thing since antibiotics were in order. I'm on my way back to the show this morning. Come along with me. . . it's only a train ride and and short cab trip away. Ah, here we are! That didn't take long. Come, there's something I want to show you - this viburnum x juddii. It's a hybrid with a heavenly scent. Please, come closer so you can experience its sweet fragrance. Oh look, this rose sculpture is where I ran into one of my Master Gardener classmates with her guide dog and friend on Saturday. She's an inspiration to our class, volunteering her time on gardening projects for blind and visually-impaired people. This thornless sculpture is just one of many tactile experiences at the show. Aren't the roses fragrant? And here's another topiary from the Chicago High School for Agricultural Sciences display. It was designed and constructed by the students, and made from materials recycled from previous projects. When it's dismantled everything will be reused or recycled. The mission of this unique public magnet school on the city's south side is being a college preparatory high school that provides opportunities for diverse students from across the city to study agriculture with the goal of developing marketable skills as well as college level competencies. It's a very cool school! I wonder if they use this tractor on their 72-acre farm. Isn't this pretty? Purple heucheras might be nice here too. Maybe I'll add some yellow-green heucheras and hardy ferns to the english ivy sprawling into our side yard from next door. The heuchera looks like a villosa. . . wish we could find a label somewhere! Let me know if you spot one. This Cedrus Atlantica 'glauca pendula,' or Weeping Blue Atlas Cedar isn't hardy here in zone 5, but it might be happy in your garden if you're in zone 6-9. I enjoyed this sculpture of liatris, agapanthus, and bamboo. Isn't it cool? Oh look, I remember this gigantic bouquet! Before we go, let's take one last look at that flowerpot Yorkie. I'm not very crafty but he looks like something even I could make. I think he and George would get along just fine. I'm glad you came along to check out the garden show. I hope you enjoyed your visit. This was my first year attending the show, but definitely not the last. Maybe you can get away again next year for a stroll through Navy Pier and a peek at the show with me. Time to catch the train back home where we're still waiting patiently for spring. Renee's Garden, one of the sponsors of this year's Spring Fling, graciously provided Fling Committee members free seeds to give gardeners attending our discussion on garden blogging at the Chicagoland Flower & Garden Show on Saturday. Renee's garden sells fine heirloom flower, herb, and gourmet vegetable seeds from around the world. Since Renee was so generous and provided more seeds than we needed at the show, I have some to give away! This centuries-old French heirloom bibb lettuce has big heads of radiant color with beautiful ruby-red leaves that surround tightly folded green hearts. Merveille is a visual treat that is wonderfully ornamental in the garden. This cherished favorite of many generations will please your palate with large heavy rosettes of crispy, fine-flavored leaves. We import our selected cultivar of Merveille from Europe, because it reliably produces an abundance of big, heavy heads with a particularly lovely color, form, and flavor. If you live in the US or Canada and would like a packet of these seeds, please leave a comment telling me what other vegetables you're growing in your garden this year. Even if you don't normally grow veggies, this lettuce is so pretty it would be divine in an ornamental garden. Leave your comment by midnight central time on Saturday, March 14, and on Sunday I'll draw names from a hat and announce the winners! p.s. I'm off to the garden show again today! 3/16/08: Hi Everyone! Thanks for playing! Please see the March 15, 2009 post for a list of the winners. Winners, please email me your full name and mailing address, and I'll get seeds out to you pronto! I had a memorable day my first time attending the Chicagoland Flower and Garden Show on Saturday with Spring Fling committee members Gina from My Skinny Garden, MrBrown Thumb, and Mr. McGregor's Daughter. You've probably seen some of their 'big picture' shots, so I thought I'd share a few fun pieces of garden art from the show. A moss pig looks like he was getting ready to nosh on the marigolds at the Chicago High School for Agricultural Art's display garden. The first three shots are from this display, created by students at the school. My niece attended the Ag. school, and was valedictorian of the first graduating class at it's new location sited on 72 acres - the last farm in Chicago. The rooster was made of coleus and begonias - and (I think) dried grass for the tail. He was also part of the high school's large display garden, along with the bee below. The bee was suspended from cables, and glided back and forth along tracks at the ceiling. It was difficult to get a clear photo of it because of the movement - Advanced Sports Shooting came to the rescue for this shot. On a different theme, there was something serene, yet whimsical about this ginormous Buddha. This guy, made from flower pots, was my favorite critter. If I'd found a replica at one of the vendor's booths, I would have had one more thing to carry home! There was so much to see I could do a month of posts. For now I hope you'll enjoy some of the more lighthearted garden art I saw at the show. Our presentation went very well. I was nervous when I started, but felt more comfortable as I got into it. I'm not sure I'll ever get over my fear of public speaking entirely, but it was confidence-building to get through it without passing out or making a fool of myself! Thanks to all of you for your encouragement and support, and for your comments! They were a big part of my presentation, and I really appreciate you taking the time to share your reasons for blogging with me so I could share them with our audience. Beth Botts, Chicago Tribune garden writer was in the audience. I was thrilled we got a chance to meet and chat with her. Mr.Brown Thumb, Gina, and I stayed at the show for awhile after our presentation to talk with audience members who stuck around to chat with us. We received such positive, enthusiastic audience feedback - it was really nice. The three of us also got a chance to chat with Bill Aldrich, publisher of Chicagoland Gardening magazine, and received very positive feedback from him as well. All in all, I'd say while I have no plans to quit my day job, our presentation was a success, and I'm proud of us! The clock ticks. The fire splutters. The cat sings. There's a knock. Open the door and there's a smile, outstretched arms, a splodgy kiss and a rush of feet. And a day transformed. Youngest Daughter and her little guy recently moved back to the Chicago area. They came to visit and play Sunday afternoon. What a joy to welcome them home! 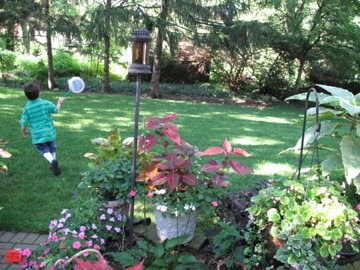 Our little guy catching bugs in the back yard at his birthday party last year. While following links recently, I came across a site called One Green Generation. I remember seeing badges for The Growing Challenge in other bloggers' sidebars last year and visiting the site. With no place to plant veggies, I sighed and moved on. I'm glad I ran into it again, perused the site, and came across The Growing Challenge - From Seed to Seed . It's a ramped up version of the Growing Challenge, which encourages gardeners to grow food from seed. Gardeners can participate in either challenge. The former includes saving seeds from the garden for planting the following year. Last fall I built a raised bed in our sunny side yard and filled it lasagna-style, leaving it to rest and do its microbial thing over the winter. The reason for the bed is to once again be able to grow some vegetables, something I've been doing since the age of ten and have missed tremendously the past five years. I decided it would be fun to join The Growing Challenge, and will post about my adventures (and misadventures!) in veggie gardening at least weekly during the growing season. I'll be collecting some of the seeds from the fruits (and vegetables) of my labor, and you'll be hearing about that here too. I want to encourage anyone who is growing vegetables to visit One Green Generation, check out the two challenges, and consider joining the fun!